In 1924, the RIrA grew to 5,772 men and, by the following year, had grown still more to reach 7,500 men. It was to stay at 7,500 men until 1933. The force now had six infantry battalions, three cavalry regiments, two mountain regiments, and one field battery. Upon achieving independence in 1932, political tensions arose over the continued British presence in Iraq, with Iraq's government and politicians split between those considered pro-British and those who were considered anti-British. The pro-British faction was represented by politicians such as Nuri as-Said who did not oppose a continued British presence. The anti-British faction was represented by politicians such as Rashid Ali al-Gaylani who demanded that remaining British influence in the country be removed. From 1936 to 1941, five coups by the RIrA occurred during each year led by the chief officers of the Army against the government to pressure the government to concede to Army demands. At 0500 hours on 2 May 1941, the Anglo-Iraqi War broke out between the British and Rashid Ali's new government when the British at RAF Habbaniya launched air strikes against the Iraqis. By this time, the army had grown significantly. It had four infantry divisions with some 60,000 men. At full strength, each division had three brigades. The Iraqi 1st and 3rd Divisions were stationed in Baghdad. 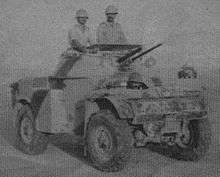 Also based within Baghdad was the Independent Mechanized Brigade comprising a light tank company, an armoured car company, two battalions of "mechanized" infantry transported in trucks, a "mechanized" machine-gun company, and a "mechanized" artillery brigade. The Iraqi 2nd Division was stationed in Kirkuk, and the 4th Division was in Al Diwaniyah, on the main rail line from Baghdad to Basra. As noted above, all these "mechanized" units were transported by trucks. The war came at a great cost in lives and economic damage - a half a million Iraqi and Iranian soldiers as well as civilians are believed to have died in the war with many more injured and wounded - but brought neither reparations nor change in borders. The conflict is often compared to World War I, in that the tactics used closely mirrored those of the 1914–1918 war, including large scale trench warfare, manned machine-gun posts, bayonet charges, use of barbed wire across trenches and on no-mans land, human wave attacks and Iraq's extensive use of chemical weapons (such as mustard gas) against Iranian troops and civilians as well as Iraqi Kurds. By the eve of the Invasion of Kuwait which led to the 1991 Persian Gulf War, the Army was estimated to number 1,000,000 men. Just before the Persian Gulf War began, the force comprised grouped into 47 infantry divisions plus nine armoured and mechanised divisions, grouped in seven corps. This gave a total of about 56 army divisions, and total land force divisions reached 68 when the twelve Iraqi Republican Guard divisions were included. Although it was said at the time in Western media that Iraqi troops numbered approximately 545,000 (even 600,000) today most experts think that both the qualitative and quantitative descriptions of the Iraqi army at the time were exaggerated, as they included both temporary and auxiliary support elements. Many of the Iraqi troops were also young, under-resourced and poorly trained conscripts. Hussein did not trust the army; among counterbalancing security forces was the Iraqi Popular Army. The widespread support for Iraq during the Iran–Iraq War meant Iraq had military equipment from almost every major dealer of the world's weapons market. This resulted in a lack of standardization in this large heterogeneous force, which additionally suffered from poor training and poor motivation. 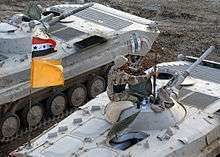 The majority of Iraqi armoured forces still used old Chinese Type 59s and Type 69s, Soviet-made T-55s from the 1950s and 1960s, and some T-72s from the 1970s in 1991. These machines were not equipped with up-to-date equipment, such as thermal sights or laser rangefinders, and their effectiveness in modern combat was very limited. The Iraqis failed to find an effective countermeasure to the thermal sights and the sabot rounds used by the M1 Abrams, Challenger 1 and the other Coalition tanks. This equipment enabled Coalition tanks to effectively engage and destroy Iraqi tanks from more than three times the distance that Iraqi tanks could engage. The Iraqi tank crews used old, cheap steel penetrators against the advanced Chobham Armour of these US and British tanks, with disastrous results. 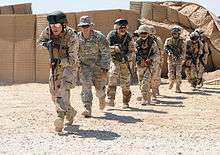 The Iraqi forces also failed to utilize the advantage that could be gained from using urban warfare — fighting within Kuwait City — which could have inflicted significant casualties on the attacking forces. Urban combat reduces the range at which fighting occurs and can negate some of the technological advantage that well equipped forces enjoy. Iraqis also tried to use Soviet military doctrine, but the implementation failed due to the lack of skill of their commanders and the preventive air strikes of the USAF and RAF on communication centers and bunkers. While the exact number of Iraqi combat casualties has yet to be firmly determined, sources agree that the losses were substantial. Immediate estimates said up to 100,000 Iraqis were killed. More recent estimates indicate that Iraq probably sustained between 20,000 and 35,000 fatalities, though other figures still maintain fatalities could have been as high as 200,000. A report commissioned by the U.S. Air Force, estimated 10,000-12,000 Iraqi combat deaths in the air campaign and as many as 10,000 casualties in the ground war. This analysis is based on Iraqi prisoner of war reports. It is known that between 20,000 and 200,000 Iraqi soldiers were killed. According to the Project on Defense Alternatives study, 3,664 Iraqi civilians and between 20,000 and 26,000 military personnel were killed in the conflict. 75,000 Iraqi soldiers were wounded in the fighting. 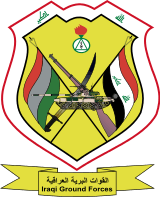 5th Corps, near Mosul, had the 1st Mechanized Division, and the 4th, 7th, and 16th Infantry Divisions. During the 2003 invasion of Iraq the Iraqi Army was defeated in a number of battles, including by Task Force Viking in the north, and the Battle of Nasiriyah and the Battle of Baghdad. The Iraqi Army was disbanded by Coalition Provisional Authority Order Number 2 issued by U.S. Administrator of Iraq Paul Bremer on May 23, 2003 after its decisive defeat during the Second Gulf War. Bremer said that it was not feasible to reconstitute the armed forces. His justifications for the disbandment included postwar looting, which had destroyed all the bases; that the largely Shiite draftees of the army would not respond to a recall plea from their former commanders, who were primarily Sunnis, and that recalling the army would be a political disaster because to the vast majority of Iraqis it was a symbol of the old Baathist-led Sunni ascendancy..."
III Corps — In 2003, Nasiriyah was the headquarters of the Iraqi Army's 3rd Corps, composed of the 11th ID, 51st Mech ID, and 6th Armored Division — all at around 50 percent strength. The 51st operated south covering the oilfields, and the 6th was north near Al Amarah, which left three brigade-sized elements of the 11th ID to guard the An Nasiriyah area. The Coalition Military Assistance Training Team (CMATT), headed by Maj. Gen. Paul Eaton, was the organization set up by the United States military with the responsibility of training and development of the new army. On August 2, 2003, the first battalion of new Iraqi Army recruits started a nine-week training course at a training base in Qaraqosh. They graduated on October 4, 2003. Training of Iraqi forces was initially done by Vinnell Corporation contractors. In April 2004, several Iraqi battalions refused to fight as part of the force engaged in the First Battle of Fallujah. In June 2004, the CMATT was dissolved, and passed on its responsibilities to the Multi-National Security Transition Command – Iraq (MNSTC-I) (initially headed by Lt. Gen. David Petraeus) with the new focus on providing security for the Iraqi people from the emerging threat posed by the Iraqi insurgency. In May, Iraqi army forces launched Operation Lion's Roar (later renamed to Operation Mother of Two Springs) in Mosul and surrounding areas of Nineva province. Iraq became one of the top purchasers of U.S. military equipment with the Iraqi army trading its AK-47 assault rifles for the more accurate U.S. M-16 and M-4 rifles, among other equipment. In June 2008 the Army moved troops to the southern Maysan province. Following a four-day amnesty for insurgents to turn over weapons, the Iraqi Army moved into the provincial capital Amarah. Budget problems continued to hinder the manning of combat support and combat service support units. The lack of soldiers entering boot camp is forcing Iraqi leaders at all levels to face the dual challenge of manning and training enabler units out of existing manpower. In the 2015 Pentagon budget, a further $1.3billion has been requested to provide weapons for the Iraqi Army. However, the New York Times reported that "some of the weaponry recently supplied by the army has already ended up on the black market and in the hands of Islamic State fighters". The same November 2014 article contended that corruption is endemic in the Iraqi Army. It quoted Col. Shaaban al-Obeidi of the internal security forces, who told the paper's David D Kirkpatrick: “Corruption is everywhere." The article claimed that one Iraqi general is known as “chicken guy” because of his reputation for selling the soldiers’ poultry provisions. The Iraqi Special Operations Forces are a Ministry of Defence (Iraq) funded component that reports directly to the Prime Minister of Iraq. An Iraqi soldier standing on a turret of a T-72 tank in March 2006. The Iraqi Army Band performs during a ceremony at Camp Taji in May 2006. Each of the JOINT Operational commands also include DBE, Federal Police, Emergency Police, Oil Police, FPS, etc. in their command as well as Iraqi Army. Karkh Area Command (KAC) - Western Baghdad. Responsible for the Kadhimiyah, Karkh, Mansour, Bayaa, and Doura Security Districts. Rusafa Area Command (RAC) - Eastern Baghdad. Responsible for the Adhamiyah, Rusafa, Sadr City, New Baghdad, and Karadah Security Districts. 25th Commando Brigade - 'Baghdad Eagles' - former 4th Bde, 6th Div. Has received commando training by U.S. Special Forces and air assault training. The Multi-National Force Iraq has also conducted a variety of training programs for both enlisted men and officers including training as medics, engineers, quartermasters, and military police. Beyond the various courses and programs being held in-country, both American staff colleges and military academies have begun taking Iraqi applicants, with Iraqi cadets being enrolled at both the United States Military Academy and the US Air Force Academy. CMATT's main recruiting stations are located in Baghdad, Basra and Mosul. The most desired recruits are individuals who have prior military service or are skilled in specific professions such as first aid, heavy equipment operation, food service and truck driving. A recruitment target of approximately one thousand men is desired to eventually form a 757-man battalion. Soldier fallout usually occurs due to voluntary withdrawal or failure to meet training standards. Due to the current demand for these battalions to become active as soon as possible, the first four battalions' officers, non-commissioned officers, and enlisted men are being trained simultaneously (in separate groups). Notable differences in training between CAATT and former training under Saddam's regime include schooling in human rights, the laws of land warfare, and tolerance in a multi-ethnic team. 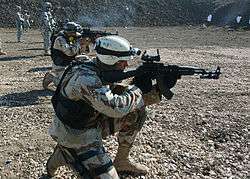 Based on the philosophy used by the U.S. military to boost its own size in response to World War II — that an army can be built faster by focusing on the training on its leadership rather than enlisted men — CMATT has pursued a similar strategy of focusing recruitment and training on commissioned and non-commissioned officers for the remaining 23 Iraqi battalions. Upon successful completion of officer training, these groups of officers will form the battalion's leadership cadre, which will then be responsible for overseeing its own recruitment, training, and readiness of its enlisted men. It is hoped that having the Iraqi leadership train its own will overcome problems faced by CAATT's training process; namely recruitment, desertion, and unit loyalty. Virtually all of the equipment used by the former Iraqi Army was either destroyed by the U.S. and British Forces during the invasion, or was looted during the chaotic aftermath shortly after the fall of the Hussein regime. Four T-55 tanks however have been recovered from an old army base in al-Muqdadiyah and are now in service with the 1st Division. In February 2004 the U.S government announced that Nour USA was awarded a $327,485,798 contract to procure equipment for both the Iraqi Army and the Iraqi National Guard; however, this contract was canceled in March 2004 when an internal Army investigation (initiated due to complaints from losing bidders) revealed that Army procurement officers in Iraq were violating procedures with sloppy contract language and incomplete paperwork. On May of that same year the U.S. Army Tank-automotive and Armaments Command (TACOM) stated that they would award a contract worth $259,321,656 to ANHAM Joint Venture in exchange for procuring the necessary equipment (and providing its required training) for a minimum of 15 and a maximum of 35 battalions. The minimum bid would begin to be delivered immediately and further orders could be placed until the maximum of 35 battalion sets or September 2006 after the first order was fully delivered. In May 2005, Hungary agreed to donate 77 T-72s to the Iraqi Army, with the refurbishment contract going to Defense Solutions to bring the tanks up to operational status for an estimated 4.5 million dollars US. After a delay in the payment of funds from the Iraqi government, the 9th Mechanised Division received the tanks at its headquarters in Taji over a three-day period starting on November 8, 2005. On July 29, 2005, the United Arab Emirates gained approval to purchase 180 M113A1 APCs in good condition from Switzerland, with the intent to transfer them to Iraq as a gift. Domestic political opposition in Switzerland successfully froze the sale, fearing that the export would violate the country's longstanding tradition of neutrality as well as perhaps make Switzerland a target for terrorism. 173 M113s, 44 Panhards, and 100 FV103 Spartans were donated by Jordan, Pakistan and UAE. 600 AMZ Dzik-3 (Ain Jaria) APCs were ordered in Poland (option for 1,200) for delivery by Jan 2007. 573 Otokar Akrep APCs for delivery by Jan 2007. 756 Iraqi Light Armored Vehicles (option for 1,050) for delivery by November 2008. Greece donated 100 BMP-1 to the Iraqi Army. In August 2008, the United States has proposed military sales to Iraq, which will include the latest upgraded M1A1 Abrams battle tanks, attack helicopters, Stryker armored vehicles, modern radios, all to be valued at an estimated $2.16 billion. M1 Abrams United States Main battle tank 146 Out of 146 delivered at least more than a third was destroyed by IS. ↑ "Measuring Security and Stability in Iraq" (PDF). U.S. Department of Defense. August 2006. p. 52. ↑ "The Gulf Military Balance in 2010" (PDF). Center for Strategic and International Studies. 22 April 2010. p. 2. ↑ "Iraq Withdrawal: U.S. Abandoning Plans To Keep Troops In Country". The Huffington Post. 15 October 2011. 1 2 3 "Graft Hobbles Iraq's Military In Fighting Isis". The New York Times. 23 November 2014. ↑ Kenneth M. Pollack, Arabs at War: Military Effectiveness 1948–91, University of Nebraska Press, Lincoln/London, 2002, p.150, 156. ↑ D. Kurzman, Genesis 1948, 1972, p. 382. ↑ I. Pappe, The Ethnic Cleansing of Palestine, 2006, p. 129. ↑ Pollack, 2002, pp. 149–155. ↑ Solomon (Sawa) Solomon, "The Assyrian Levies, The Final Chapter", Nineveh Magazine 4Q,93,V16,No4. ↑ Pollack p.173-5, citing among others Tzvi Ofer, 'The Iraqi Army in the Yom Kippur War,' transl. 'Hatzav,' Tel Aviv: Ma'arachot, 1986, p.128-65. Pollack notes that the various accounts of Iraqi operations on the Golan Heights are highly contradictory. He relies on Ofer, 1986, which is an Israeli General Staff critique of the official Iraqi General Staff analysis of the battle. ↑ Robert Fisk, The Great War For Civilisation; The Conquest of the Middle East (Fourth Estate, 2005), p.853. ↑ Bremer III, L. Paul (2007-09-06). "How I Didn't Dismantle Iraq's Army". The New York Times. Retrieved 2010-05-04. ↑ Rohr, Karl. "Fighting Through the Fog of War". Marine Corps Gazette. Archived from the original on December 1, 2008. Retrieved 29 December 2008. ↑ See Gulf War Air Power Survey, Vol. I, pg 68/97. ↑ Bing West (7 December 2011). No True Glory: A Frontline Account of the Battle for Fallujah. Random House Publishing Group. p. 118. ISBN 978-0-307-80834-9. ↑ Kalev Sepp (2005-03-14). "Prepared Statement before the House Subcommittee on National Security, Emerging Threats, and International Relations regarding the training of Iraqi Security Forces". Archived from the original (PDF) on May 23, 2005. Retrieved 2008-10-07. ↑ Ibrahim Al-Marashi; Sammy Salama (7 April 2008). 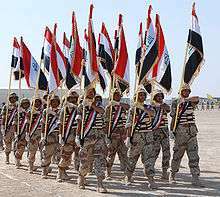 Iraq's Armed Forces: An Analytical History. Routledge. p. 212. ISBN 978-1-134-14564-5. ↑ "US arrests senior Iraqi commander". BBC. Retrieved 11 October 2014. ↑ "Iraq to dissolve National Guard". BBC. Retrieved 11 October 2014. ↑ "Iraqi command and control center opens doors amidst turnover of new territory". Multi-National Force – Iraq. 2006-05-04. Archived from the original on 2006-07-08. ↑ "Iraqis to Command Four Northern Divisions by February, U.S. General Says". U.S. Department of defense. December 1, 2006. Retrieved 11 October 2014. ↑ MTRs transferred in order of event: 8th, 4th, 6th, 5th and 1st (2 Nov). IA 5th MTR driving toward success - Daily article on www.mnf-iraq.com, 20 November 2006. ↑ "Pentagon Press Briefing June 23, 2006, with Secretary Donald Rumsfeld and Gen. George Casey". MNF-I. Retrieved 11 October 2014. ↑ House Armed Services Committee, "THE CONTINUING CHALLENGE OF BUILDING THE IRAQI SECURITY FORCES," http://armedservices.house.gov/pdfs/OI_ISFreport062707/OI_Report_FINAL.pdf, 27 June 2007, note 53, page 120. 1 2 John Pike. "New Iraqi Army (NIA)". Retrieved 11 October 2014. ↑ "The Advisor, MNSTC-I Newsletter, July 8, 2006" (PDF). Archived from the original (PDF) on 2006-11-12. ↑ "Iraqi Bedouins seek role in secure future". 25 January 2010. Retrieved 11 October 2014. ↑ ""7th Iraqi Army Division now Controlled by Iraqi Government", MNF-I Press Release November 03 2007". Retrieved 11 October 2014. ↑ "Defense News (dead)". Retrieved 11 October 2014. ↑ http://www.strategypage.com/htmw/htarm/articles/20070415.aspx Cougars Cousin Badger Arrives in Baghdad. April 15, 2007. ↑ Foss, Christopher (2008-08-12). "Iraq orders Abrams tanks through US FMS programme". Jane's. Retrieved 2008-10-07. 1 2 3 4 5 6 7 8 9 "World Air Forces 2016 pg. 21". Flightglobal Insight. 2015. Retrieved 4 January 2016. ↑ AirForces Monthly. Stamford, Lincolnshire, England: Key Publishing Ltd. September 2016. p. 36. ↑ AirForces Monthly. Stamford, Lincolnshire, England: Key Publishing Ltd. August 2016. p. 32. 1 2 3 4 5 6 7 8 9 10 11 12 13 14 15 16 17 18 19 20 21 22 23 24 25 26 27 28 "SIPRI". Stockholm Int’l Research Institute. Retrieved 21 January 2016. Michael Knights, "Free rein: domestic security forces take over in Iraq," Jane's Intelligence Review (November 4, 2010), http://www.janes.com/news/security/jir/jir101104_1_n.shtml.